Click the Load Photo button to open a photo. 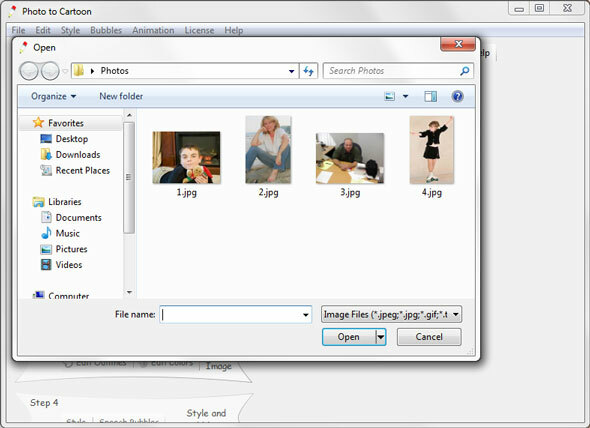 The supported file formats are jpeg, jpg, gif, png, bmp, tiff, wmf and emf. For best results, use high quality photographs. A high quality photo is a high resolution photograph (at least 1000 pixels by 1000 pixels) with good contrast and not grainy. If it's a photo of a person, it should be taken in good lightning conditions (but not in bright sun) and the face should be in focus. To crop the photo before loading select File->Load and Crop Photo from the menu instead. In the Crop window, click on the image and, while holding down the mouse key, drag the mouse to make a selection than click on the Use Selection button. To make a photo snapshot from a web camera select File->Load WebCam Snapshot and click Make Photo in the Capture Photo from WebCam window (a photo will appear at the bottom part of this window) and then click Accept. After the capture window is closed, the Crop window will appear where you can crop the image or just proceed to use the entire snapshot. 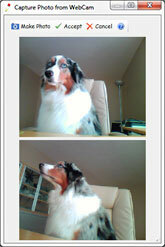 Please note that many web cameras produce low resolution grainy images. Please use high-resolution regular camera photos for best results.